Dexing wrote: Nagarjuna compared someone clinging to emptiness as a theory to "a customer to whom a merchant has said that he has nothing to sell and the customer now asks to buy this 'nothing' and carry it home". i can see that clinging to emptiness as a "theory" could be silly, but what do you do when everything you perceive is empty? if this is clinging to emptiness, you cant get away from it. everything is empty full stop. since everything is empty anyway, is there any harm in being immersed in emptiness. i have heard some people say that you should not dwell in anything. you cant get away from emptiness... everything is empty, how could you not dwell in emptiness. so why do people say that it is not good to be attached to emptiness. all is empty anyway. at least thats the way i see it. this is not a theory, this is reality. what do we do when faced with the reality and the advice "not to make your stand in anything". i suppose you could say that emptiness is not "anything" to stand in. 1. Impute to it the properties of a view. 2. Impute ownership of that view. 3. Impute a high value to the view, and to the ownership. 4. Exaggerate the value of your new view without limit. 5. Denigrate anyone who fails to value your view as much as you do. Five easy steps, nothing to it. I may not know the way to Nirvana, but I can get you to the hell realms in a flash! but Cat, i understand that attachment to a 'theory' of emptiness can be silly, and it seems clear that attachment to a 'view' about, or of emptiness can be fruitless, but what if one is attached to the real thing? it is not good to rest in actual emptiness? is this an attachment to that which neither is nor is not? (emptiness). at the moment i am not even seeking 'normal' mind, to just get on with things, not looking at emptiness/this too much, only occasionally looking at the emptiness of things. i dont know whether this is correct or not. i dont have much confidence in my teacher sometimes, which is not good, but i know that he is brilliant. i am a very poor student, but that doesnt bother me, its just the way i am. i couldnt have a better teacher, and i know it. ps. Cat, ive been through the hell realms, believe me! you too eh?! Hekigan Roku (Blue Cliff Record) Case 51 "What is This?" Two monks turned up at Seppo's hermiatage. seppo jumped out of the gate and said "what is this?" the monks also said "what is this?" Seppo hung his head and popped back into the hermitage. later the monks came to Ganto. who got them to recount their story about the visit to Seppo. Ganto said: "Ah, how I regret that in those days I did not tell him (Seppo) the last word!" "If you want to know the last word, it is just this." I would argue that this is emptiness and emptiness is this, so to say that this is the last word is hiding in the weeds of thisness. an attachment to emptiness. there is not a thing that can be said. and no where to hide. nothing clings. throw it out. worse than falling into concepts. Perhaps stop talking about it (theory) and put that realization to use (practice). The Buddha taught that Ordinary Beings are as if in a burning house. How do we get out of the house? If you make something, there is something to burn. If you put everything down, there's no burning. White Lotus wrote: but Cat, i understand that attachment to a 'theory' of emptiness can be silly, and it seems clear that attachment to a 'view' about, or of emptiness can be fruitless, but what if one is attached to the real thing? Such a question as you ask if probably beyond my abilities to answer, but I just can't resist having a bash at it anyhow. First attempt: You refer to the "real thing". Of course, emptiness is not a thing! Thus one might say there is nothing to attach to, so if you are attached to emptiness you must be attached to a delusion, since attachment to actual emptiness is not possible. Second attempt: If emptiness is a thing in the sense that it is a property of the universe, well, properties are concepts, imputations if you like, and we are back to attaching to a view. Third attempt: It might be good to rest in emptiness, but it depends on what exactly you mean by resting. Emptiness is not a place, therefore there is no place you can go to rest in it. Understanding the emptiness of things thoroughly leads quietude and equanimity, or so I believe. Thus by a thorough understanding of what emptiness means, and more importantly, by a thorough understanding of what emptiness does not mean, one's mind naturally comes to a state of peace. This can be so even though one's life is very busy. p.s. I sure hope Huifeng takes a look at this! He could probly blow the whole question to bits. Nobles Dexing and Laura, thank you. Understanding the emptiness of things thoroughly leads quietude and equanimity, or so I believe. Thus by a thorough understanding of what emptiness means, and more importantly, by a thorough understanding of what emptiness does not mean, one's mind naturally comes to a state of peace. nor emptiness to be attached to. smokelike concerns, nothing but delusions. how can you make something when theres no one to make, and nothing to make with. smokelike concerns, nothing but delusions. when seeing emptiness... just see it. no worries. just as it is. just as i am/not. White Lotus wrote: Nobles Dexing and Laura, thank you. That's pretty much what I was driving at. One might ask, "What is emptiness"? It is clearly neither a place nor a thing. If one views it as a property of things, one loses real emptiness and gains an impostor concept. So what is it? Is it valid to say, emptiness is a method, applied to the mind, in an attempt clean up all the spurious concepts we attach to our perceptions? emptiness is something you actually perceive. but guess what... emptiness is a bubble that you burst... then everything is just Mind, there is no longer emptiness. Your own nature is mind, objects are mind, sound is mind, wind is mind, emptiness is mind, form is mind. With me emptiness came first, then it burst and i broke through to a perception of all being Mind. at one time i would say... no mind, no nature, no world, no reality. then i said, not mind not mindlessness, not nature not without nature... not real, and not without reality. now. now i say Mind is Mind, nature is nature, world is world, reality is reality, void is void. but fundamentally i see all things as having the one flavour of Mind. what is mind? this feeling you have within you right now is mind. the feeling of what is within you is mind, the feeling of what you see outside you is mind, the feeling of heart is mind, the feeling in your head is mind. your body is mind... it is all one feeling. have a look and you will see! in a whole new light. its all thoroughly real. 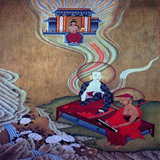 Bodhidharma broke through emptiness to Mind. It is whatever you want it be. Ride the horse in the direction its going. catmoon wrote: So what would be the origin of these false thoughts of solidity? No no no I'm talkin about this life. Oh wait, maybe you are too? thoughts of solidity are not false, neither is perception of emptiness. just mind, in two of its many differernt flavours. we all talk about this life, everyone has her or his own dharma. every dharma is mind dharma. a diamond has many glints. a pearl reflects truth from all angles. just prcticing Mind dharma through elevated view. With love, from White Lotus. White Lotus wrote: enjoying ice cream... it is enlightenment. drinking tea... is perfect emptiness, just as it is. I just don't think these things are "enlightenment." Enlightenment is a just more complex and more challenging than what you imagine or say. Eating an ice cream and enjoying those sense pleasures isn't cessation or enlightenment or any sort of accomplishment as I understand it in the Buddhist sense. Ngawang Drolma wrote: Eating an ice cream and enjoying those sense pleasures isn't cessation or enlightenment or any sort of accomplishment as I understand it in the Buddhist sense. It's not about enjoying sense pleasures, but completely being a part of your moment-to-moment experience. Moment-to-moment, whatever you are doing, that's your life. Enlightenment only happens now. Just like this. "Enlightenment" is only as complex and special as you think it up to be. people tend to think that enlightenment is something. actually it is nothing at all. a wise master once asked what sudden illumination is answered... that there is no illumination to attain. in enlightenment there is no attainment whatsoever. there are things that one may perceive, such as the emptiness of own nature, mind and phenomena, but this perceiveing is completely unnecessary. people are always looking for enlightenment, but actually there is nothing to find. i have broken through the iron wall of emptiness and now perceive all things as Mind. the experience is not the same as that of emptiness Mind. it is completely normal. in emptiness mind, mind itself is empty, and you can sense this. when consciousness perceives Mind, it is gently radiant, but nonetheless completely normal. i have heard people say that you cannot find Mind with Mind... this i strongly disagree with. a mind can perceive itself. instead of everything being empty to the perception. i now see all things as a presence. every idea, every form, cans of food, cups, computers, concrete are all individualites and yet one and the same mind... which is how it was with emptiness, but now it is all things with the flavour of mind. emptiness is gone. i have a funny question! if i am just a figment of Mind, which i am. who is this mind that thinks me? Laura... thanks for your humour! Dexing... thanks for your insight! to not without a thing, from the start. too much ice cream can make you ill! but a little... well, thats another matter. Your a collection of a bunch of stuffs called the skandhas. I'm glad you like my humor, gentle as it is. the words won't hit "this"!.. my head is not wet..